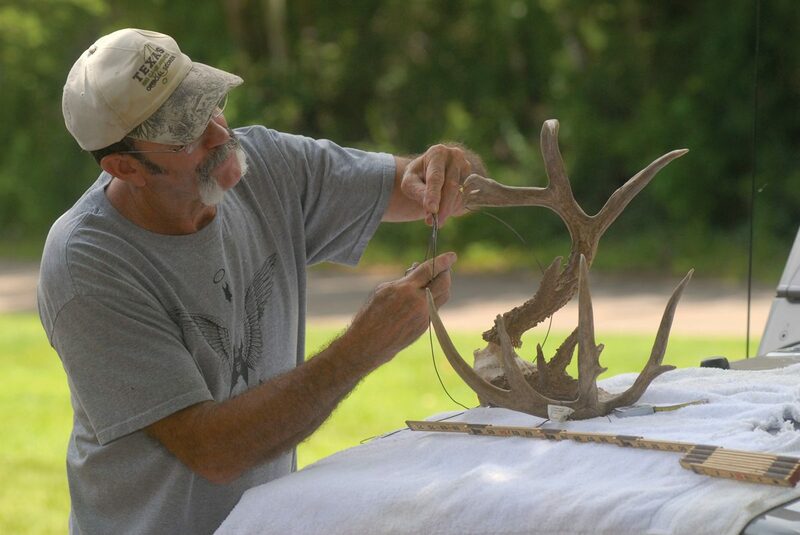 The B&C system takes into account a variety of antler characteristics to tally a score. Among them are the number score-able points (one inch or longer), beam length, tine length, circumference and inside spread. After performing a series of measurements, the figures are tallied to reach a “gross” score. Calculated differences between the left and right antler are deducted to determine the “net” score. Minimum net green Boone & Crockett scores for program eligibility are as follows: pronghorn – 70, typical mule deer – 145, non-typical mule deer – 160, typical white-tailed deer – 125 to 140 (depending on region), and non-typical white-tailed deer – 140 to 155 (depending on region). Ben Bartlett has been a certified as a TBGA scorer since the program’s inception in the early 1990s. He has since taped well over 100 animals. The Lufkin insurance agent also is an official scorer for Pope and Young, a well-known bowhunting organization that recognizes trophy class animals using the B&C scoring system. The most difficult rack Bartlett ever scored came from the Finley Flat area north of Lufkin. The B&C website (boone-crockett.org) offers a wealth of information on scoring, including downloadable scoring sheets that are accompanied by easy-to-follow instructions for more than a dozen animals. There are dozens of TBGA scorers around the state. You can get a complete list according to city at texasbiggameawards.org. Both B&C (boone-crockett.org) and P&Y pope-young.org) maintain all-time record books dedicated to recognizing a wide variety of North American big game animals meeting minimum scores. Both organizations adhere to strict “fair chase” policies and do not recognize animals taken inside escape-proof fenced enclosures. Minimum scores vary from one animal to the next. For whitetails, B&C calls for a 170 minimum on typicals and 195 on non-typicals after 60 days drying. The minimum P&Y score for typicals is 125 and 155 for non-typicals after 60 days drying.